Submitted by Taps Coogan on the 10th of July 2018 to The Sounding Line. As the following chart from Statista.com shows, China manufactured 40% more cement in 2017 than every other country in the world combined. “An incredible statistic from Bill Gates’ blog shows that between 2011 and 2013, China consumed more concrete than the U.S. did in the entire 20th century. The Three Gorges Dam alone required 16 million tons of cement. The country’s insatiable thirst for the stuff hasn’t been quenched and it comfortably remains the world’s king of concrete. In 2017, China produced more cement than the rest of the world combined, according to the U.S. Geological Survey. While China’s massive construction boom is awe inspiring, it has been accompanied by one of the fastest credit expansions in history and, critics assert, it has been more of an instrument to inflate GDP numbers than a reflection of productive economic growth. Despite representing 18% of the world’s population, roughly 15% of world GDP, and 6% of the world’s landmass, China produces and consumes nearly 60% of the world’s cement. Something just doesn’t add up. 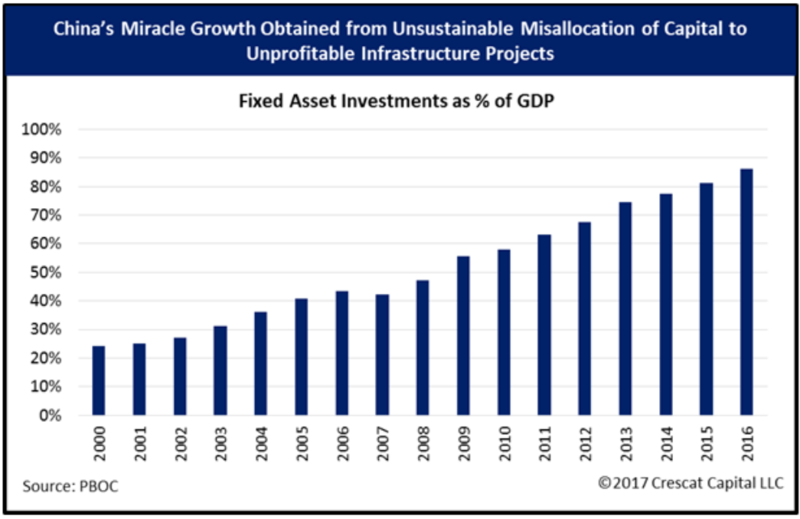 As we first discussed here, China has been spending ever greater amounts on fixed capital investment relative to the size of its economy. 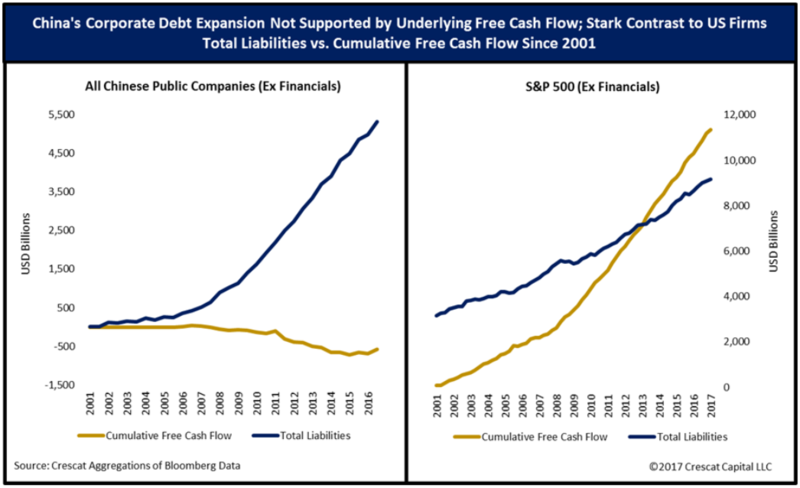 Meanwhile, Chinese corporations are cumulative free cash flow negative going all the was back to 2000 yet their debts have been piling up. While the US government is oft criticized (especially here) for running unsustainable deficits, as we recently pointed out, the various layers of Chinese government are now running a larger deficit than all the layers of US government, despite China having a smaller economy and a smaller tax base. While China’s world beating economic expansion may continue for a long time to come, it is showing many of the characteristics that have led to economic collapses in virtually ever other economy in history: massive miss-allocation of capital, exponential debt growth, aging demographics, and a looming trade war.